Which Materials, Tools, Supplies and Equipment Belong in Your Metal Clay Toolkit? The truth is that you can start working with metal clay with relatively little in the way of materials, tools, supplies, and equipment. 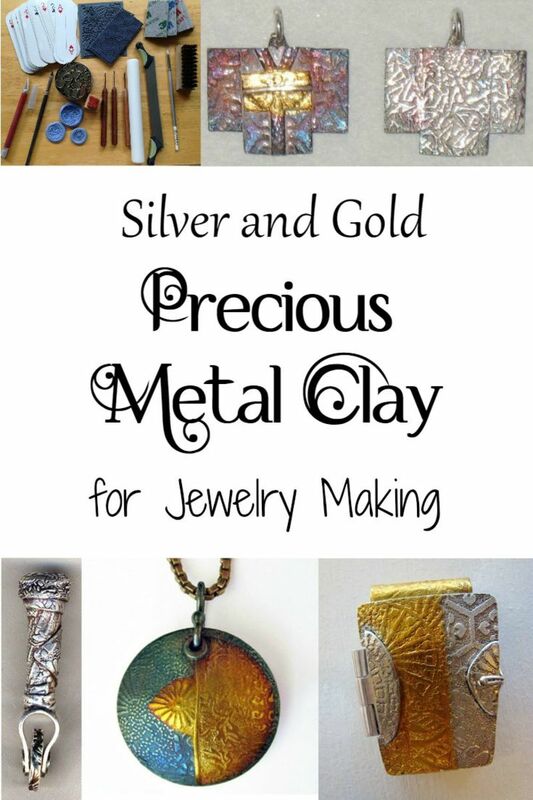 Fine silver metal clay has the shortest list of requirements—the metal clay itself, a few playing cards, a length of PVC pipe, some plastic food wrap, a darning needle or craft knife, a butane kitchen torch, and a soldering pad or kiln shelf. But if you want to work with other types of metal clay—gold clay, bronze clay, copper clay, steel clay, brass clay—you'll need some additional materials, tools, supplies, and equipment. Then, beyond the basics, there are are nice-to-have items that can give you more creative options, let you work faster/easier, and/or help you produce more professional results. Every metal clay artist has his or her own list of recommended tools and supplies for working with metal clay. As the former Senior Editor and Technical Editor of Metal Clay Artist Magazine (now Creative Fire online) and a metal clay artist, I'm often asked my opinion about which items are must-have, nice-to-have and would-love-to-have items. In this article I'll share with you the materials, tools, supplies and equipment I find especially valuable in creating metal clay art. The only required material is metal clay, although you may want to add other materials discussed in subsequent sections. If you wish to work in silver, purchase fine silver, sterling silver or enriched sterling silver clay, either in a ready-to-use lump form or in powdered form (easily mixed with water to form lump clay) in your choice of brand or formula. You may also wish to purchase syringe clay in a compatible formula. Fine silver sheet or paper type clay, while optional, is useful for bezels and cutting or punching out applique.embellishments. Buying prepared plain silver clay paste is optional, since you can easily mix up as much as you need for any project simply by mashing in the desired quantity of water a drop or two at a time into lump clay. 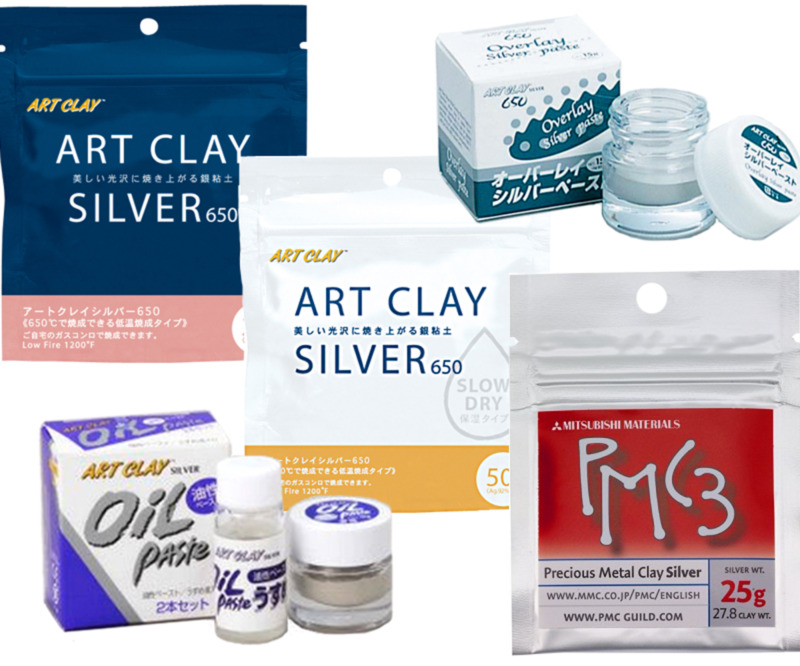 The new formula of Art Clay Silver paste has some of the properties of its old "oil paste" product and can be used to join silver metal to silver metal. You can also mix up silver clay oil paste that can be used for extra-strong joints on either unfired or fired metal clay (or metal) by diluting certain brands of silver lump clay with water and pure essential lavender oil (or certain other essential oils) or with Sherri Haab's PasteMaker solution. See my article on how to make homemade metal clay oil paste for more information. Bronze, white bronze, rose bronze, copper, steel, pearl gray steel, etc., in your preferred brand and formula. Popular brands and formulas include Metal Adventures' BRONZclay, FASTfire BRONZclay, and COPPRclay, Goldie Bronze bronze clay in several formulas, Art Clay Copper, Hadar's Clay powdered clays in a wide range of metals and formulas, Metal Mania Metal Clay bronze, copper and brass clay, Météor bronze and copper clay, NobleClay bronze and copper clay formulas, and Prometheus bronze clay. 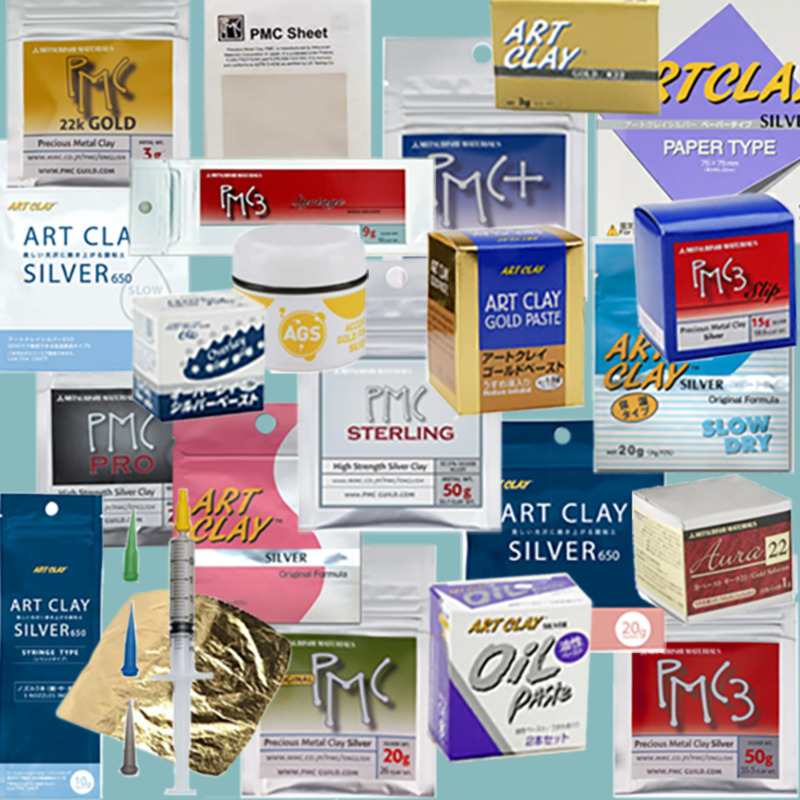 Aussie Metal Clays recently introduced eight different base metal clay formulas that are flexible when dry and were formulated specifically for use with the Sillhouette CAMEO or Portrait electronic cutting machines. A note about flexible formulas for use with the Silhouette or similar cutting machines: I purchased a Silhouette CAMEO after seeing some of the exquisite work done by renowned artists like Wanaree Tanner. The ability to create intricately pierced designs, tiny cut-outs for appliqué and gallery wire style bezels for stone setting and/or to etch the surface of pieces or components before firing opens up nearly endless design possibilities. However, it is important to use a clay formula that retains some flexibility when dry. While it is possible to add glycerine to add flexibility, getting the proportions right can be tricky. So if you either own or plan to acquire one of these cutting machines, consider using one of the commercial flex clay formulas for that purpose. My article on BRONZclay provides extensive information about working with the original BRONZclay formula. For more information about other bronze clay brands and formulas, see my article on Bronze Metal Clay for Jewelry Making and Sculpture. Materials such as cubic zirconia (CZ) or inexpensive manmade gemstones, dichroic (or other) glass cabochons, wire, bezel cups and/or prong stone settings, jewelry findings, resin and other materials that can add color to your pieces are optional, but they can be extremely useful and will expand your design options considerably. Most, but not all, CZs (cubic zirconia) can be fired in place successfully, as can many lab-created or synthetic stones. Both can give the look of gemstones without the expense and come in faceted and cabochon cuts in a variety of sizes, shapes and colors. Be sure to buy from a reputable supplier who can tell you whether the stones are safe to fire in place and whether they require specific firing methods or conditions to survive the heat and/or prevent changing color. Dichroic or other glass cabochons can be fired in some types of metal clay at certain firing schedules, or you can create a setting in your piece and set them after firing. If you fire them in place, be sure to use a firing schedule suitable for glass and leave enough space around the cabs to allow for the clay to shrink without putting too much pressure on the glass as it cools. 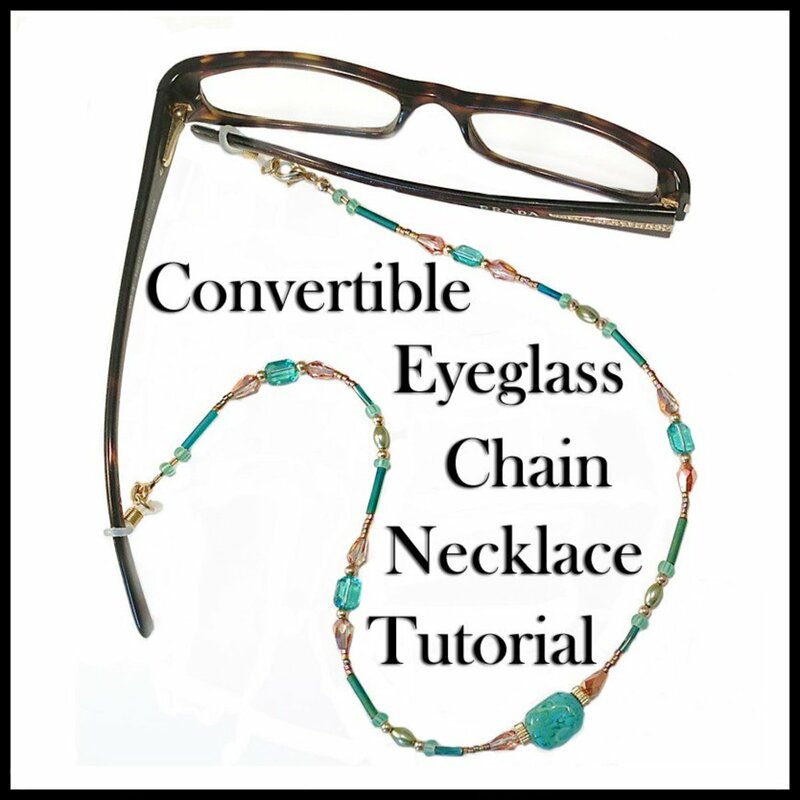 If you are making jewelry or other pieces set with gemstones that cannot be fired in place, or if you just like the look of non-clay settings, you can embed fine silver bezel wire, bezel cups or wire (to be bent into prongs) into silver clay. If you are making jewelry, you also may want or need commercial jewelry findings if you aren't going to make all your own findings. These may include brooch/pin backs, earring findings, clasps, etc. You can solder jewelry findings to your pieces after they have been fired. There are also jewelry findings in different metals that are designed to be embedded and fired in place in different types of metal clay. Metal Clay Findings is one brand; Embeddables is another. U/V resin or epoxy resin can be used to fill metal clay bezels. U/V resin must be cured either in direct sunlight or under a U/V light, such as a U/V nail lamp, or direct sunlight to cure. You can cut a photo, photocopy, magazine image, drawing, painting or other image to size to fit just inside the bezel, seal it completely on both sides with clear packing tape or Mod Podge, and then add a small amount of resin to the bezel, smooth the sealed image over it and add more resin to fill the bezel. Note: If using Mod Podge, allow each side of the sealed image to dry thoroughly before embedding it in resin. You can pour resin in a bezel in thin layers and embed other items that do not contain any moisture (e.g., dried flowers, herbs, charms, glitter, lace, fabric), letting each layer dry before adding the next if you want to embed the items at different depths. You can also combine these two techniques, embedding a photo in a layer of resin, letting it dry and then adding more layers of resin embedded with other items. Resin may be tinted with various colorants or purchased in ready-to-use colors. You may want to use enamel, glass paints, metal paints, polymer clay, colored pencils, beads or other materials to add colorful elements to your fired metal clay designs. Gold metal clay, foil or other accents and high-quality natural and lab-created gemstones can add luxurious accents to your designs, especially if you will be making jewelry. 22K gold clay is a fabulous material, but unfortunately using it for an entire piece of jewelry isn't practical or cost-effective for most metal clay artists. Fortunately, a little goes a long way, and using even a small amount to create bezels, small balls, or other embellishments on a silver clay design can make a big impact. Because of the extremely high cost and limited demand, few metal clay suppliers keep it in stock any more, but many will special order it for you. This ready-to-use, commercially available 22K gold thick metal clay slip can be applied to fired silver clay, glass or ceramic and then kiln fired. 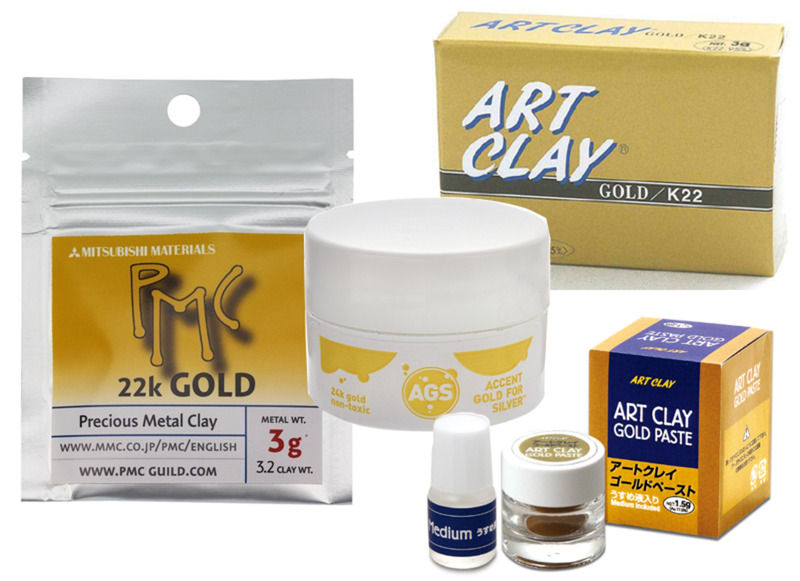 These 22K gold, 24K gold and 18K rose gold solutions, respectively, are metal clay "paints" that can be applied to silver metal (including sintered silver metal clay) and then fired to bond the gold layer to the silver. Many metal clay suppliers carry either thick 23.5K or 24K gold for keum-boo. AllCraft USA carries both the thick 24K gold foil and also a special double-thick 24K foil for keum-boo. Some natural stones, both precious and semiprecious gems, can be embedded in metal clay and fired in place successfully. Some can be fired successfully only at lower temperatures and/or shorter firing schedules. Some (including diamonds) can't be fired successfully in an atmospheric firing (torch fired or fired on an open kiln shelf, exposed to air) but can be fired successfully in activated carbon. And some heat-sensitive stones will not tolerate any type of firing and must be set post-firing. Be sure you know whether or not the faceted stones or cabochons (AKA cabs) you are using can be fired in clay or need to be set post-firing. Mardel Rein of Cool Tools put together an excellent chart of which gemstones can be fired in metal clay successfully, under what conditions and using which firing schedules that you can download as a PDF. Some lab-created gems (e.g., Chatham Emeralds, Moissanite diamonds, Gilson opals) also fall under the category of luxury materials. In general, valuable lab-created gems should be set after the metal clay has been fired. It's important to buy the highest quality gemstones you can afford if they will be fired in place. The more inclusions a stone has, the more likely it is to fracture during the heating or cooling process. Gem Resources sells a wide variety of stones, both manmade and natural gems, many of which have been test-fired in metal clay, and the test results for those stones are included in the product information on the website. For more information about which stones are usually safe to fire and how to test a sample gemstone, see my in-depth guide to setting gemstones in metal clay. When you're just getting started in a new creative pursuit, sometimes it can be more convenient to purchase a basic starter kit rather than finding and purchasing the required materials, supplies and equipment separately. Most metal clay suppliers offer their own pre-assembled kit of basic tools. Some suppliers offer advanced toolkits as well. And some offer starter kits complete with clay and/or firing equipment (butane torch, kiln, etc.). Which Metal Clay Toolkit Should You Buy? After looking at every metal clay toolkit I could find from online suppliers, I still haven't found a toolkit that contains all the basic tools I use on a regular basis and doesn't contain any items I don't use routinely. Also, many people who decide to try out metal clay have worked with polymer clay, ceramics and/or metal, and already may own some tools that can be adapted to metal clay (cleaned to pristine condition first, of course!). And different people have different budgets to spend on metal clay tools and are happy to make do with found household items instead of buying some of the basic tools (e.g., using a stainless steel teaspoon as a burnisher). For those reasons, it's difficult for me to recommend a specific pre-assembled toolkit to metal clay newbies. It all depends on what you will use, which tools you prefer for a specific job, what and how much you want to be able to do, and how much you can and/or want to spend on tools initially. I suggest you start by decided which tools and supplies you absolutely need in order to get started on the techniques you want to do in metal clay. Then decide which ones you want to purchase and which ones you will substitute with free or inexpensive alternatives. The following lists of the tools and supplies I recommend should help you develop your buying list. 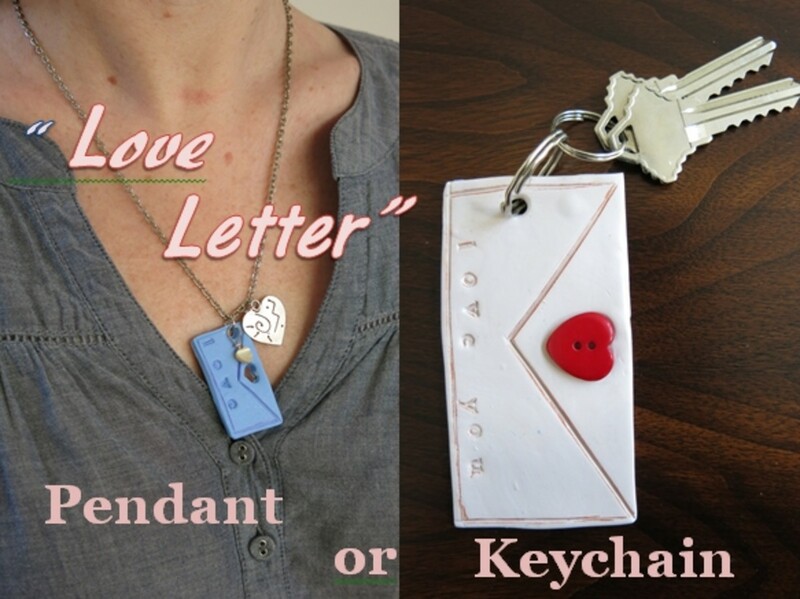 I have also included links to other metal clay artists' recommendations for a starter kit. Once you know which items you want to purchase, look at the starter kits from various online suppliers. In most cases, each supplier's kits will be different. If you are lucky enough to find a kit that includes only items from your shopping list, go ahead and buy it. You probably will save a little money by purchasing the them as a bundled deal. Otherwise, I recommend assembling your own custom toolkit that will meet your individual needs and budget. If you've never tried working with metal clay before, I suggest you start with a modest set of basic tools and improvise as many as you can from free or low-cost items. 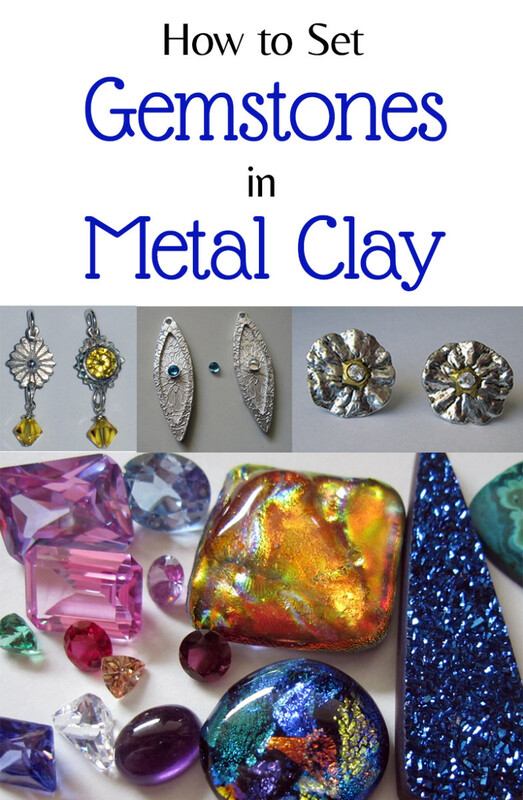 Once you've worked with metal clay for a while, you'll know if you want to pursue it in depth. If you decide metal clay isn't for you, you won't have made a large investment in tools, supplies or equipment you won't use. If you find you love working with metal clay and want to build on your basic toolkit, you can upgrade your improvised tools and add others as you need or want them. Metal clay tools, supplies and equipment—or gift certificates to your favorite suppliers—make great wish list items for birthdays and holidays! Although you can certainly make do with just a few of these items, in my opinion everything on this list is useful enough to be considered part of a basic metal clay toolkit. You will need to apply a release agent to prevent clay from sticking to tools, cutters, work surfaces, molds, texturing mats and materials that are not inherently nonstick. In general, I prefer to use olive oil. (Some people recommend against using any type of oil on rubber stamps, but I have never had a problem with it). For intricately detailed textures, I use a non-stick spray for metal clay—either Cool Slip from Cool Tools or HattieS No-Stick spray from Metal Clay Supply. Olive oil and Badger Balm are popular and inexpensive choices. Cool Tools has a terrific product for your hands called ClayMate. You can use their Slik product on your hands and also as a release agent and/or clay conditioner (see below). For original BRONZclay or other formulas that tend to stain or be sticky, I recommend applying a very thin film of Gloves In A Bottle skin shielding lotion on your hands, over and under your nails and worked into your cuticles, and then letting it dry completely before applying a very thin layer of olive oil, Badger Balm, ClayMate or Slik on top. I use a glass surface marked with a grid pattern on the underside that I bought in a crafts store, but there are lots of other good options. A plain piece of acrylic works fine, as does a self-healing cutting mat. If you use a plain transparent surface such as glass or acrylic sheet, you can tape a piece of graph paper to the underside, creating a useful grid pattern to help you measure and align your clay. Use a release agent or, preferably, cover it with a piece of flexible non-stick (e.g., Teflex or Teflon) sheet or a lightly oiled plastic sheet protector or flexible, transparent report cover (see below) to keep the clay from sticking to the rolling surface. I suggest smooth Teflon, Teflex or Paraflexx nonstick sheet for rolling out and assembling metal clay components. Don't use SILPAT or other textured nonstick mats or sheets. Highly recommended for rolling out slabs of metal clay (be sure to oil them lightly first). Get the clear, shiny kind, not anti-glare or frosted. I highly recommend getting a nonstick roller, such as the Cool Tools ultimate roller (I have it in both the 11" and 7" lengths). But you can certainly use an acrylic roller or even a 6"–8" piece of PVC pipe in the diameter you prefer. These are essential for rolling out clay slabs or sheets of even, uniform thickness. The cheapest method is to use a spare deck of playing cards. Playing cards can vary slightly in thickness; buying good-quality cards makes it more likely that their thickness will conform to the most commonly accepted thickness equivalent for metal clay (01" or .25 mm per card). You can tape together stacks of playing cards with the appropriate card value on top and facing up (e.g., for a stack of three cards, use two random cards topped with the 3 of hearts (or spades, diamonds or clubs), face up. You'll need two stacks for each card thickness (two 2-card stacks, two 3-card stacks, etc.) If you can find extra-long playing cards (Umbra is one brand that makes them), you'll appreciate the extra length when you're rolling out your clay. Alternatives include .01" or .25 mm thick matboard, color-coded plastic graduated slats made specifically for this purpose (available from Art Clay World USA and several other suppliers), or my favorite, Cool Tools Clay Thickness Rolling Frames, which allow you to roll from any angle while keeping the the roller supported to maintaining an even thickness. Avoid using a lightweight cup, such as a disposable paper or plastic cup (except in a class or workshop); they're too easy to knock over accidentally and create an unwanted water spill. I prefer to use a covered glass individual butter dish (I got mine from Crate & Barrel), an idea I got from a colleague whom I'd gladly credit if I could remember who told me about it. I love the fact that it's glass and has a wide base, so it won't tip over, and that it has a lid to keep the water from evaporating in between work sessions. Another good option is to get a small, rectangular glass caddy for sugar or artificial sweetener packets. Regardless of the container you choose, clean it very well before switching from one type of clay to another, or get a dedicated water dish for different types of clay to avoid cross-contamination. You can use tap water if the water in your area is fairly pure, but distilled water will discourage mold from forming on your stored clay and slip and also will give you more predictable results with liver of sulfur (LOS) patinas, which will be affected by whatever minerals and other impurities may be in your local water supply. Use any small, clean, plastic or glass containers with air-tight snap-on or screw-on lids. Well-washed, empty film canisters and lip gloss pots are great for this purpose. You can use metal, plastic or both for mixing slip, reconstituting dried clay, mixing glycerin into clay to make it flexible, etc. I recommend using small, good-quality, synthetic bristle artist's watercolor brushes for working with metal clay. At a minimum, you should have a small pointed brush, a flat-edged "bright" brush, and a medium round brush, plus a water brush. The water brushes with built-in water reservoirs in the handles are very handy, and many of my colleagues swear by them. Since it is very difficult to thoroughly clean brushes that have been used with metal clay, I like to keep Keep a separate, dedicated set of brushes for fine silver clay, sterling silver clay, PMC Pro, and each type of base metal clay to avoid cross-contamination. My article on Metal Clay Storage provides a range of excellent long-term and short-term metal clay storage solutions. You'll use this to cover or wrap fresh clay to help keep it moist. I recommend plain (not sticky) Glad brand wrap. A Nalgene travel cosmetic spray bottle works well, or you can buy bottles for this purpose. You may also want to get an extra to fill with olive oil for misting your hands, tools, clay, work surface, etc. I highly recommend also getting a very small atomizer bottle with a very fine spray for misting clay lightly with water when it gets a little dry. This isn't strictly necessary, since a scalpel or sharp craft knife can be used for most purposes, but most people find them useful, especially for marking the location of small holes to be drilled later. I use both a regular needle tool and one with an ultra-fine point for different purposes. You also can make your own needle tool with a darning needle and polymer clay. Form the handle from the raw polymer, decorating it as desired with canes or veneer. Center the blunt end of the needle in the handle and insert it partway (I suggest at least 1/2 inch). Cure the clay in an oven and pull out the needle. Sand and finish the polymer handle as desired and then glue the needle back into the hole with cyanoacrylate glue (super glue). You'll want different types for different purposes. I suggest getting one rigid and one flexible clay blade and a disposable scalpel and/or an X-ACTO-style craft knife. Small aspic, clay, fondant, sugar paste or cookie cutters in a variety of shapes and sizes. Collect these in as many sizes as you can collect for cutting holes in clay, forming bails, etc. Both Celie Fago and Linda Stiles Smith have created nesting hole cutters from brass tubing that I recommend highly. Plastic drinking straws can also be pinched to shape the tips for cutting small holes for embedding square or marquise shaped stones in fresh clay. Any art supply store or drafting supplier will have a selection of drawing templates in basic shapes, and some polymer and metal clay suppliers offer a wide range of shape templates specifically for use with these materials. It's also useful to buy some template blanks that you can cut into your own custom shapes. This can be anything from toothpaste caps to buttons, from lace or fabric to texture mats or texture plates, from organic materials—wood, stones, leaves, even food—to baby sneaker treads. My in-depth article on Metal Clay Textures will give you literally dozens of ideas for things you can use or make to texture your clay. Sizes 61–80 are most useful for jewelry making and metal clay. Facet's downloadable drill bit size conversion chart is a handy tool for converting jewelry-size drill bit numbers to the equivalent diameters in inches and millimeters. Sometimes referred to as "rubber fingers," these tools are especially good for caulking cracks or joints with fresh clay, syringe or thick slip and then smoothing the surface and blending the fresh material seamlessly into the surrounding clay. I suggest getting a variety of sizes, shapes and degrees of firmness. Air drying metal clay components is ideal, since it minimized warping or cracking around the edges. Placing them on top of a piece of open-cell foam sheet allows some air to get underneath the fresh clay so it can air dry more evenly. Available at some fabric and craft stores. These are incredibly useful tools for cleaning holes in metal clay greenware (dried but unfired metal clay) and for smoothing small areas where sanding abrasives can't reach. I find it's worth spending a little more to get the smooth, round variety, which don't splinter like the rougher ones. These are good for for smoothing metal clay greenware. Foam-tipped eye shadow applicators You can find these in any drugstore (or maybe in your cosmetics drawer or bag, if you have any unused sponges and/or applicators). for pre-finishing bone-dry, unfired clay. You can get the Kiss brand at chain drugstores like CVS, Walgreens and Rite-Aid. Sally Beauty Supply carries the Tropical Shine 4-way Buffer. Have separate sets for greenware and for metal (including fired metal clay), and separate sets for different types of metal. These are perfect for smoothing metal clay greenware prior to firing. I find the thin wipes give a smoother finish than the thicker ones. You will also need higher (finer) grits from automotive supply stores if you want to achieve a mirror shine on silver clay. It's important to buy automotive-grade wet/dry sandpaper or emery paper rather than regular sandpaper to avoid getting grit into the sanding dust, which can be used for making slip or paste if it is grit-free. I recommend 3M Softback Sanding Sponges in Medium, Fine, Superfine, Ultrafine and Microfine grits. You'll need separate sets for different types of metal clay, and separate sets for unfired vs. fired metal clay. Not absolutely necessary, but great for getting a smooth finish. Color-coded, micron-graded polishing papers in 400, 600, 1200, 4000, 6000 and 8000 grit equivalents. Not absolutely essential unless you're trying to achieve a mirror finish, but they make a big difference in the smoothness of the finish. I recommend getting several sets—one to use on each type of metal clay greenware and another set for each type of fired metal clay (metal). A great tip I learned from Tonya Davidson of Artful Success is to mark the back of each piece with a permanent marker to identify the grit until you memorize the color coding. for initial burnishing of just-fired metal clay. Unless you want to scratch the surface of fine silver intentionally (which can create a soft, matte finish similar to a Florentine finish), use the brass brush on fired silver clay and the stainless steel brush on fired base metal clay. You will want at least two. They can be made of stainless steel, agate or borosilicate glass. (I own two stainless steel burnishers and one each of the agate and glass varieties.) Burnishers also come in different shapes. Agate burnishers, while more expensive than metal, stay cooler while burnishing gold foil to fine silver for keum-boo, but cannot be quenched in water. You also can use a stainless steel butter knife or spoon as a burnisher. I like to use a Solderite board or shelf placed on top of a soldering tripod. You will use these for quenching hot metal, soldering and much more. These let you remove items from the kiln (if you're using one) safely without the risk of burning your fingers. I recommend stainless steel covered steam-table pans or Cool Tools No-Flake Firing Foil, which can be cut and folded into small, lidded boxes in custom sizes that don't spall (shed black flakes) in the kiln. You can also use a round stainless steel bowl topped loosely with a stainless steel sheet or plate. I recommend against using ceramic fiber containers. This includes PMC Sterling, PMC PRO and most formulas of base metal clay. Fine silver clay embedded with certain heat-sensitive stones (including diamonds) can be torch-fired briefly or fired on an open shelf briefly (depending on what the particular gemstone will tolerate) and then fired in activated carbon. Some (but not all) gemstones that cannot be fired successfully in an atmospheric firing (i.e., exposed to air while being fired on an open kiln shelf or with a torch) will survive a carbon firing successfully. Wear welding gloves or gloves made from Zetex, ZetexPlus or Kevlar when handling hot metal or reaching into the kiln to remove your fired pieces or hot firing container. Liver of sulfur (often referred to as LOS) can produce beautiful rainbow patinas or dark grey-black patinas on silver metal. It also can be used to darken copper and bronze. Liver of Sulfur degrades when exposed to light and/or moisture, and liquid LOS has a much shorter shelf life than dry chunks, which in turn have a much shorter shelf life than LOS patina gel. If you are going to use dried LOS chunks, buy only as much as you expect to use within six months. Buy LOS that comes in a small metal can or opaque jar or canister with a resealable, air-tight lid and store it in a dark, cool place. Note: To get a true black patina on metal (including fired metal clay), you would need to use a strong chemical oxidizer like' Griffith Silver Black Oxidizer or Black Max. These can produce a black patina instantly on contact with gold, bronze and copper as well as silver metal The problem is that these oxidizers consist mostly of very strong acid, which means they are toxic, corrosive, and can do permanent damage to you if you come into direct contact with one of them! They also require special handling and safety precautions, not to mention protecting whatever they come into contact with (like your sink, if it's stainless steel). Personally, I won't use them, but if you do, make sure to handle them with the appropriate respect and follow all the recommended safety precautions (at the minimum!). But if you can live without a pure black patina, LOS or Baldwin's Patina are much healthier, safer, less dangerous options. This patina is used for darkening copper and steel but not bronze, silver or gold. Great for mixed metals applications including mokume-gane. I recommend Wenol Metal Polish or Pikal Care, applied very sparingly with a clean, dry, untreated polishing cloth. Examples include Sunshine Polishing Cloths and Pro Polish Pads. For removing excess patina from the high points of a finished piece or removing light tarnish periodically. I recommend Selvyt Universal Polishing Cloths (woven unbleached cotton) or Selvyt Professional heavy-weight Polishing Cloths (unbleached cotton velvet) for final polishing to remove dust, fingerprints and any metal polish residue from metal. It's a good idea to measure your pieces in the fresh, dried and fired stages and keep notes on them so you can better predict the shrinkage you get using different formulas and for pieces in different types, thicknesses and sizes. The ruler should have a metal edge, if possible, and also serves as a useful straight edge for cutting and trimming. You'll use these for sketching designs, making pattern templates, placing cutting, drilling, or syringe guidelines or registration marks on metal clay greenware, etc. You'll use these primarily for cutting out templates. If you want to do keum-boo application, get a second small, very sharp pair to use exclusively for cutting the gold foil. For keum-boo, sandwich the gold foil inside a small, folded square of tracing paper and cut through the paper and gold foil "sandwich." While these aren't an essential part of a basic metal clay toolkit, they're extremely useful to have if you plan to do more than the occasional casual metal clay project. For capturing fine details (or molds I plan to use a lot), I love using Knead-a-Mold from Townsend Atelier and Silicone Plastique. Other high-quality 2-part silicone molding putties include MegaSil and Cool Tools' MegaMold. Useful for making carved texture plates, tear-away textures, tool handles, drying and shaping forms, and more. Premo! Sculpey and Kato Polyclay are high-quality brands created for professional polymer clay artists. See my article Metal Clay Textures for more information on making photopolymer plates and sources for the supplies needed. 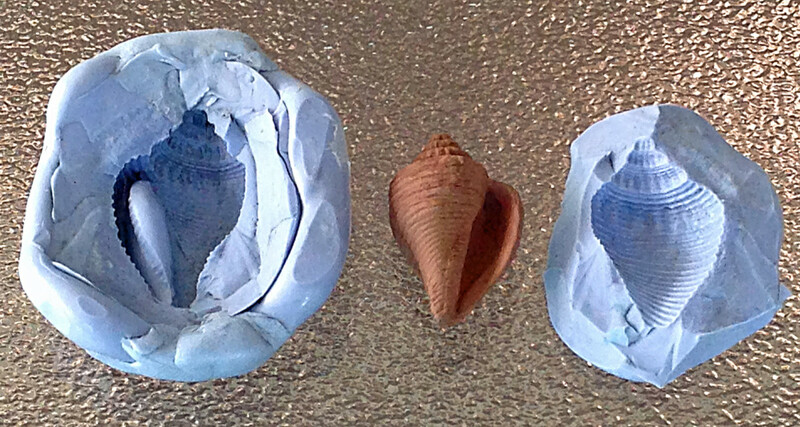 This is a paper-based modeling material you can shape and sculpt, then cover with metal clay. It has a high volcanic ash content that allows it to hold its shape during firing to create a supportive structure for hollow metal clay shapes. It also can be used to fill areas where stones will be set post-firing so that the setting areas don't shrink during firing. Make sure it's absolutely dry all the way through before firing it. This can be used to create armatures to support volumetric pieces, including hollow pieces, during firing. The combustible core or support burns away in the kiln during the firing process, and a slow ramp rate should be used. An open-shelf pre-firing in a kiln is required when used with metal clay formulas that must be fired in activated carbon. Important: Never torch fire these materials; they are highly flammable/combustible! These tools and supplies aren't necessary for a very basic metal clay toolkit, but you'll want to own many of them if you plan to carve directly into leather hard metal clay, make carved polymer clay texture plates, extrude metal clay snakes or tubes, embed or set gemstones, make metal clay rings, hammer and manipulate metal (including riveting), add jump rings and other findings, saw metal or metal clay greenware, solder metal, add gold accents to silver using the keum boo technique, or just do certain tasks such as sanding and polishing more easily or efficiently. 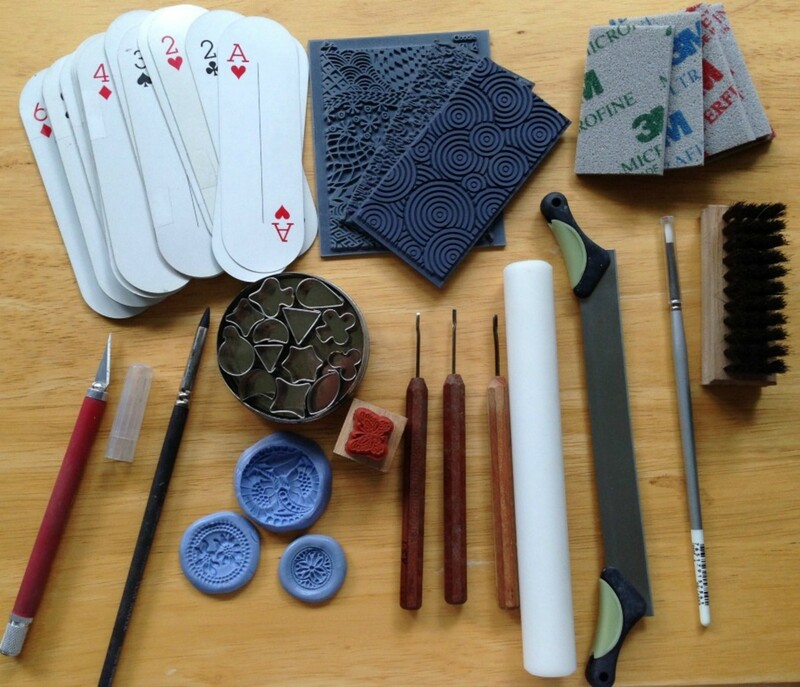 You'll use these for carving leather-hard metal clay and cured polymer clay. Unfortunately Dockyard micro carving tools are no longer made, but other brands such as Flexcut and Ramelson USA are good alternatives. You can also buy fabulous Japanese micro carving tools, but those are very expensive. The gouge (AKA U-gouge) carves a U-shaped trench in the material being carved. The V-parting tool (AKA V-gouge or V tool) carves a V-shaped trench in the material being carved. The 1.5mm, 2mm and 3mm carve a 90-degree angle trench. There also is a 3mm 75-degree V-parting tool that cuts a trench with a steeper angle. The plough tool (AKA plough chisel or single bevel chisel) is a single-bevel chisel that can make very deep cuts quickly (use a light touch to avoid removing too much clay). The paring tool (AKA paring chisel or double bevel chisel) is a double-bevel chisel that can carve very fine lines. The skew tool (AKA skew chisel or angled chisel) is an angled double-bevel chisel. Used with a very light touch, it's great for cleaning up tiny bits of oozed-out slip or light imperfections. In addition to carving on your leather-hard metal clay pieces and components (and any cured polymer clay pieces or components, such carving cured polymer clay fillings inside fired and finished metal clay bezels, lockets, etc.) you also can use these micro carving tools to make your own one-of-a-kind carved texture plates from cured polymer clay sheets. To learn more, see the section on carving in my article on Metal Clay Textures. If your micro carving tools have slender handles and didn't come with short lengths of clear, flexible PVC tubing to protect the extremely sharp cutting ends (and your hands), or if you lost one of the tubes, you can cut your own 1.5" to 2" lengths of Tygon tubing. A 10" length is enough to cover the ends of five or six micro carving tools. 3/8" inner diameter Tygon tubing - specifically Tygon B-44-3 PVC Beverage Tubing, 3/8" ID, 1/2" OD, 1/16" Wall, 10' Length, Clear - fits the now discontinued Dockyard micro carving tools, if you can get your hands on any. If you buy other brands of micro carving tools, you'll need to go to a home improvement store and try out different tubing to find what fits your tools. If you're going to purchase micro carving tools, you'll want to keep them sharp and burr-free, i.e., "in good nick." The Flexcut SlipStrop kit does a great job of maintaining the razor edge on micro carving tools. it has a stropping surface that matches the angle of most micro carving tools and comes with a bar of Flexcut Gold polishing compound and detailed instructions. Strictly speaking, stropping doesn't sharpen your tools (a more exacting and difficult process to do correctly, and best done professionally). What it does do is to polish and remove burrs from the cutting surfaces to help maintain the sharp edge from the factory. This kit makes quick work of it. Regardless of which stropping kit and compound you use, learn how to strop your micro carving tools correctly by reading Flexcut's helpful and informative page on stropping/sharpening carving tools. Wearing a metal lined leather thimble will protect your pointer finger or thumb (depending on how you hold your pieces when you carve) when you are carving small, narrow or curved pieces of clay. Buy one that fits the appropriate finger, or buy two, one for your thumb and another for your pointer finger. If you will be using silver metal clay, the extruder should be stainless steel (such as the Makin's Professional Ultimate Clay Extruder Stainless Steel Edition, which was designed specifically for use with metal clay) or anodized aluminum (such as the (such as the Makin's Professional Ultimate Clay Extruder). Aluminum that does not have an anodized coating will cause an adverse reaction when it comes in contact with silver metal clay. A set of basic extruder discs come with the extruder; sets of additional discs in different sizes and/or shapes can be purchased separately. If you want to extrude tubes for bails, hinges, etc., you'll also need the Makin's Professional ClayCore extruder adapters, which fit both models of the Makin's Professional Ultimate Clay Extruder. You'll want an assortment of these for setting stones in clay. You can buy sets or individual sizes that match or are just slightly smaller than the stones you use most often. If you plan to make a lot of bezel settings for stones that will be set after firing, a bezel roller will make it easier to avoid puckers or pleats as you smooth the bezel over the cabochon stone. Use this for cleaning the tops of natural or synthetic gemstones or CZs before embedding or firing the stones in place. Available in drugstores. Cotton swabs can be used to clean the tops of fire-in-place gemstones with isopropyl alcohol before firing (pointed-tip cotton swabs are best for this) or to apply patina solutions to metal (traditional round-tip swabs are best for this). Narrow foam-tipped eye shadow applicators from the drugstore also can be used with isopropyl alcohol to clean off gemstones prior to firing. I recommend a fine, bent-tipped tweezer with serrated tips for picking up gemstones, a fine, smooth-tipped straight tweezer for applying keum-boo foil, and a cross-lock tweezer for holding things (plus the aforementioned insulated tweezers for quenching and soldering). Many artists use investment ring sizing pellets (HattieS Patties is the best known brand) to prevent rings from shrinking smaller than the desired size during kiln firing. These may be used with fine silver clay or an enriched sterling silver formula that can be fired on an open kiln shelf without activated carbon. Just be aware that restricting the shrinkage of the ring band can prevent maximum sintering, in which case the band won't be as strong as if the shrinkage had been unconstrained. A stepped, stainless steel mandrel and/or a MultiMandrel is best if you can afford it. If your mandrel is made from aluminum (other than anodized aluminum, which will not react adversely with silver metal clay), be sure to cover it with a layer of freezer wrap or a HattieS Ring Forming Strip before using it to form a silver metal clay ring band. These should include a riveting hammer or, preferably, a goldsmith's hammer with a cross-peen end for riveting wire or metal tubing through pieces of fired clay or other metal. If you can afford two, you can straighten short lengths of wire by rolling the wire between the two blocks. This flexible, translucent, rubbery material protects the surface of your metal when you tap it with a rawhide mallet to flatten it. Incredibly useful, but hard to find. If you're having trouble finding a supplier, you can order it from Pauline Warg. This is a cheap and effective flush cutter for wire! This is a prepared saturated solution of dried acid granules in water that is used to remove oxidation (including firescale) from the surface of most metals (do not use with steel). The most commonly used jeweler's pickle is a solution of Sparex No. 2 pickling compound or pH Down (a swimming pool chemical), both of which are mainly sodium bisulphate. These are strong, corrosive acids that must be used with active ventilation and protective gear for hands, eyes, clothing, containers and work surfaces. Metal pickled in one of these so-called "safety pickle" solutions also must have the acid neutralized in a solution of baking soda in water. Also, use copper tongs to place the metal into or take it out of the pickle to avoid contamination the pickle solution. Safer, healthier and more eco-friendly choices include citric acid pickle, which needs to be kept at a gentle boil during use, and vinegar and salt pickle (1 to 2 teaspoons of salt mixed into 1 cup of white vinegar) which should be used warm but not hot. At a minimum, one pair each of round nose, flat nose and chain nose pliers. Bail-forming pliers can also be extremely useful. Useful for sawing apart dried clay tubes for hinges, piercing dried clay components, and much more. Heavy leather gloves (if you're using a hotplate or camp stove) or deerskin gardening gloves that fit well (if you're using an UltraLite kiln). You'll use the red, blue, pink, green and peach discs, in that order. These are amazing for polishing metal. (Don't use them on unfired metal clay!) Stack three to six 9/16", 3/4" or 1" diameter discs on the mandrel to use with a Dremel or flexshaft tool. (There also are 2", 3" and 6" diameter discs available for use on a bench lathe, if you have one.) Tip: When mounting the discs, if your rotary tool or lathe spins counterclockwise, stack the discs on the mandrel with the bristles curving clockwise (towards the right); if your rotary tool or lathe spins clockwise, then stack the discs with the bristles curving left (counterclockwise). Use a very light touch so that only the tips of the bristles touch the metal. Great for bracing your work while you sand, polish or carve. Some suppliers sell a rubber block with a square hole in the middle that's great for sanding and/or filing. Make them yourself by wrapping wet/dry automotive sandpaper sheets or emery paper very tightly and smoothly around a wood paint stick and then taping along the top and bottom edges (the short sides) with masking tape. Once you've used up the exposed surface, just tear it off to expose a fresh area of the abrasive. Never use regular sandpaper with unfired metal clay; the grit will come off as you sand and contaminate the clay dust. This is a metal-bristle brush for cleaning accumulated metal clay dust and metal particles that can clog your metal files and cutting or setting burs. These should include cross-lock tweezers with insulated handles, stainless steel binding wire, stainless steel T-pins, flux, fire coat, solder, solder pick, your choice of soldering surface (e.g., charcoal block, honeycomb block, fire brick), etc. These have many uses. Cut them into 1" x 2" rectangles to use as kiln furniture or kiln shelf spacers. Cut one into four equal strips and arrange them into a square frame that you can wrap with stainless steel binding wire and set on top of another Solderite board or kiln shelf to fill with vermiculite as a tray for firing volumetric silver metal clay pieces in the kiln. Use them as extra kiln shelves. A scrap of Solderite board also can be used to prop up one corner of a carbon-firing container lid to vent it, a tip I picked up from Tim McCreight. I recommend using at least triple-refined butane for torch firing small and/or thin pieces of fine silver clay or Art Clay Copper, doing an initial binder burn-off for metal clay that needs to be carbon-fired, fusing fine silver wire or jump rings, balling fine or sterling silver wire, adding heat patinas to fired bronze and copper clay pieces, and many other uses. Look for a torch that has a large fuel capacity/long burn time and that reaches at least 2370 °F. One that reaches 2500 °F will give you even more flexibility. You can start with a butane torch if you plan to fire only relatively small pieces of fine silver clay or other clay formulas that can be torch-fired, such as Art Clay Copper. But you'll also need a kiln for most other formulas and for making larger and/or more dimensional pieces. Fire your pieces on a kiln shelf, never directly on the floor of the kiln. Depending on the type of kiln you have, you may need to prop up the shelf on kiln posts to raise it to slightly lower than the level of the electrical elements for optimal sintering. Kiln posts can also be useful in propping up pieces during firing. For example, if you are firing a ring with a large top that overhangs the band, you can sandwich the ring vertically between two posts so that the top rests equally on both posts to avoid distortion that might occur if you fired the ring on its side. Even tiny imperfections, hairline cracks, etc. in your dried but unfired clay—including those you can't see with the naked eye—will be exacerbated (and likely visible) after firing. So, it's important to check your pieces under magnification and good lighting before firing them. Examine your pieces with a magnifier under strong daylight before you fire them. 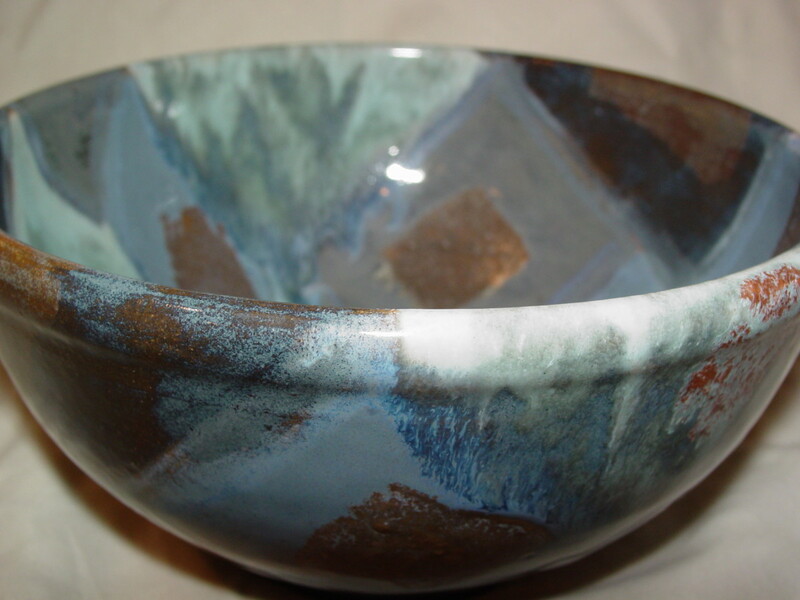 Fill or repair any cracks, chips or dings; make sure there are no fingerprints or tiny bits of metal clay residue on gemstones to be fired in place; and then refine the greenware until you're totally satisfied with it to help ensure you'll be happy with the finish after your fire your piece. This is especially important for pieces that will be given a mirror finish or a patina treatment, both of which will reveal otherwise invisible imperfections. And, of course, perfecting the piece is much faster, easier and less wasteful in the clay stage than in the metal stage. A good task lamp with a strong daylight bulb will let you do this whenever and wherever strong natural light is not available. Also called a cup warmer or candle warmer, this is useful for drying pieces quickly, although the high heat can cause wet clay to warp and/or develop small cracks around the edges as it dries, since the outside dries—and shrinks—much faster than the inside. See my article on Drying Metal Clay for much more information about metal clay drying options and the advantages and disadvantages of each method. While you don't absolutely need any of these pieces of equipment in order to work with metal clay, you'll probably want to acquire some (or perhaps all) of these items over time. While not essential, a food dehydrator is extremely useful for speeding up the air drying process somewhat without promoting much warping, as long as you use it on the no-heat or lowest heat setting. Look for one with wide, tall shelves that can accommodate larger pieces of clay without crowding. If you plan to do a lot of metal clay work, I highly recommend the Excalibur brand, if you can afford it. A cheaper alternative is to create a homemade "drying box" by cutting a hole in a cardboard box to fit the nozzle of a blow dryer (for hair). See my article on Drying Metal Clay for instructions on building and using a drying box. A rotary tumbler, stainless steel shot and burnishing liquid is the least expensive option and works well, but slowly (think hours, not minutes). A magnetic finisher/tumbler with stainless steel pins will work in a fraction of the time of a rotary tumbler and the tiny pins can get into small areas more effectively, and vibratory tumblers with appropriate tumbling media are favored by many professional metal clay artists, but both of these are significantly more expensive pieces of equipment than a rotary tumbler. A Dremel type rotary tool or a flex shaft tool (e.g., Foredom) has myriad uses for finishing and texturing metal, drilling holes, etc. If you plan to do keum-boo, the ancient Korean method for applying gold foil to silver metal, I highly recommend getting an Ultra-Lite Beehive kiln with the optional red brass inserts designed specifically for keum-boo. If you don't want to spend the money on an Ultra-Lite kiln, you can also use a flat-burner hot plate or camp stove, a 6" x 6" piece of red brass sheet and a camp stove thermometer. You may want to read my UltraLite Beehive kiln product review to learn more about this versatile "trinket kiln," which can be used for granulation, for enameling and (with the optional ceramic inserts) for firing metal clay as well as for keum-boo (with the optional red brass inserts). You'll need a UV nail light for exposing photopolymer plates and drying UV resin. I kept a thick towel with mine to drape over it while the light was on to protect my eyes from the UV light before my husband built me an enclosed box with a UV light built into the lid. A small electric slow cooker (such as a Crock-Pot) makes a good pickle pot. Whatever you use, make sure to use it exclusively for pickling metal—never for food! This is an expensive purchase and something of a luxury for beginner or casual metal clay users. But for professional metal clay artists or people with arthritis or other hand-related physical challenges, it can be well worth the investment. After years of hearing my colleagues rave about this machine, I finally bought a JoolTool for myself, and now I understand why it's unlike any of the other finishing tools I own, including a Dremel and a polishing arbor. The unique feature of this tool is that all the grinding, sanding and polishing attachment disks, called Ninja disks, look like pinwheels, so you can actually see your pieces through the openings in the disks while you're using the JoolTool. You don't have to start and stop to pull out your piece to see the areas that still need work, or a spot you might have missed. You can achieve a mirror finish on fired metal clay (or any metal) with an incredible shine, as well as a high gloss finish on cured polymer clay, in practically no time. The speed and minimal effort required to achieve your desired finish is remarkable! The abrasives are all made by 3M and there is a large variety to choose from. I definitely suggest getting the radial bristle discs, which come in a choice of 2-inch or 3-inch sizes, in addition to whatever grinding, sanding or other polishing abrasives you like to work with. For determining pre- or post-shrinkage size of metal clay components, making cutting templates, making enlarged photocopies of non-fireable gemstones to create bezel templates, etc., you can use an inkjet copier. However, you'll need to use a laser copier with toner-based ink, preferably an old Canon copier, to make tear-away textures, photopolymer plates, or photocopy transfer resists for etching metal. Make sure whichever model you get uses toner-based ink—they're getting hard to find! Alternatively, you can have toner-based copies made at a local store that offers laser printing services, such as Fedex or Staples. This includes a torch with several different-size tips, fuel (gas and either air or oxygen, depending on the torch), regulators (if applicable) and a striker. You can do a lot with a high-quality, large-capacity, hot butane torch, but for soldering gold or large pieces of metal, or for balling large-diameter wire, gold wire, or balling both ends of a wire (for a hinge, etc. ), you'll need something hotter and with more control over the size, temperature, and fuel mixture proportion of the flame. What are your favorite metal clay materials, tools, supplies, and equipment? Did I leave out any of your favorites? 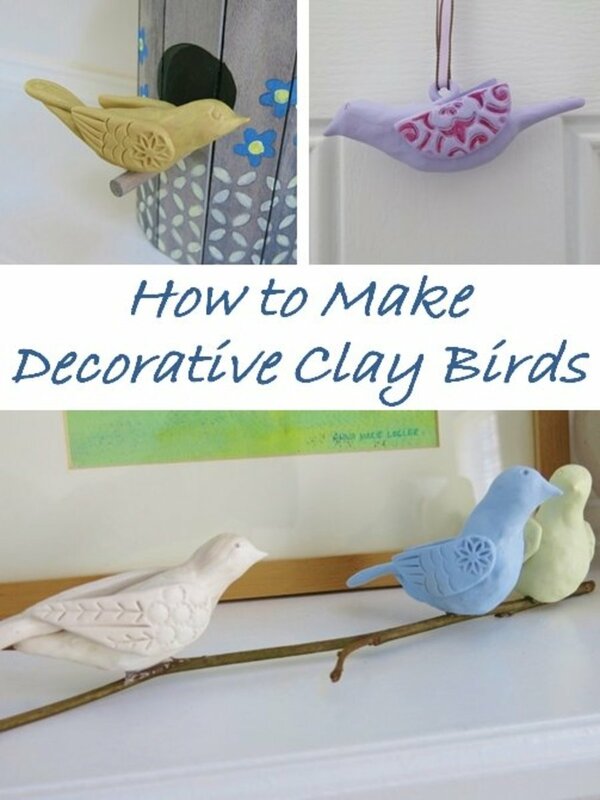 This is an excellent article for beginners in clay making. It covers all the bases and I'm basing it on what I've picked up after reading 3 good books on PMC clay jewelry making books. Great lens, I found many useful informations. @norma-holt: Thanks so much! I'm thrilled that you found this so interesting and that I was able to introduce you to the wonderful world of metal clay. Hugs to you, too! Thank you so much for this excellent resource. Exactly what I needed! You do know your jewelry making very well. What an excellent resource you have shared here. You really know your jewelry making. @anonymous: No, I haven't - Cardiff is a bit too far away from me. ;) But I'm sure my UK readers will be glad to know about you. Have you tried these Data PowerTools ? @mariaamoroso: Don't be intimidated! As I mentioned at the beginning, you can get started with very few tools and supplies - not much more than silver clay, a butane torch, a length of PVC pipe, some olive oil, a craft knife with a stainless steel blade, water, and sanding sponges/sandpaper - but most people fall in love with this material as soon as they try it and will need more tools and supplies to do all the things they want to do. ;) It's not that hard to do, and the result can be exquisite! My goodness so long lists of supply and tools. I want to try but this will mean lots of time and hard work I guess. @TolovajWordsmith: Thanks very much for your lovely feedback! I hope you find this information helpful. @anonymous: Thanks so much for your wonderful comment, John! I really appreciate it. @jnstewart: Thanks for the lovely feedback! I'm so glad you've found it helpful. Wow....lots of information here. Great job! @julieannbrady: Thanks so much, Julie! I treasure handcrafted, too. It's an honor to get such a wonderful compliment from someone whose lenses I admire so much! A quite impressive and comprehensive resource my dear! I treasure handcrafted. @Christene-S: Oh my goodness, Christene, you just made my day! Thank you so much for blessing this lens! @anonymous: Thank you for taking the time to let me know! I'm delighted that you enjoyed it. Thank you so much for making this list. 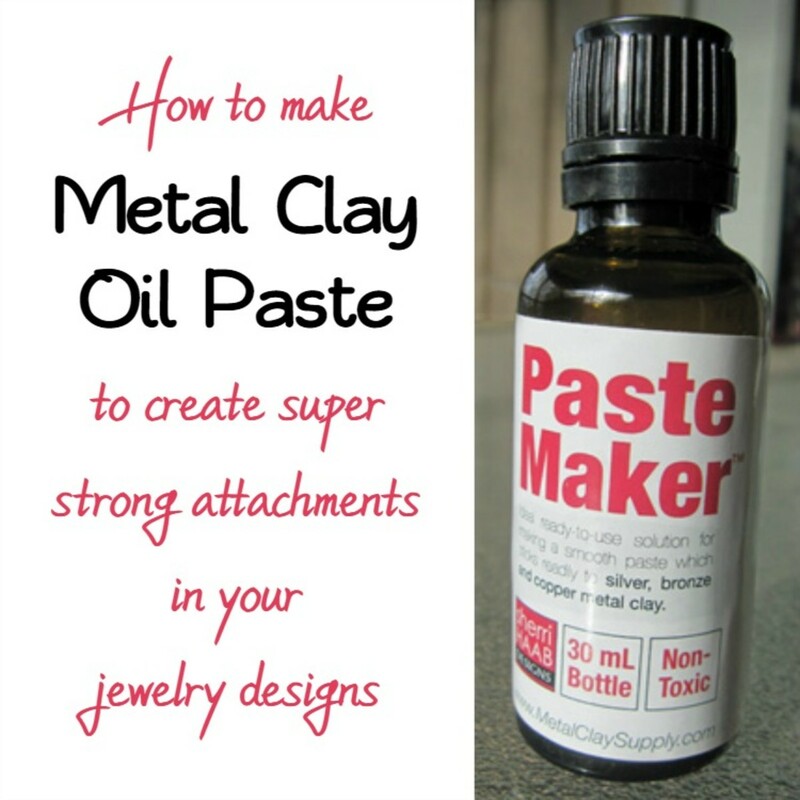 I am always looking for things that beef up my metal clay classes and save money. This is a great lens. 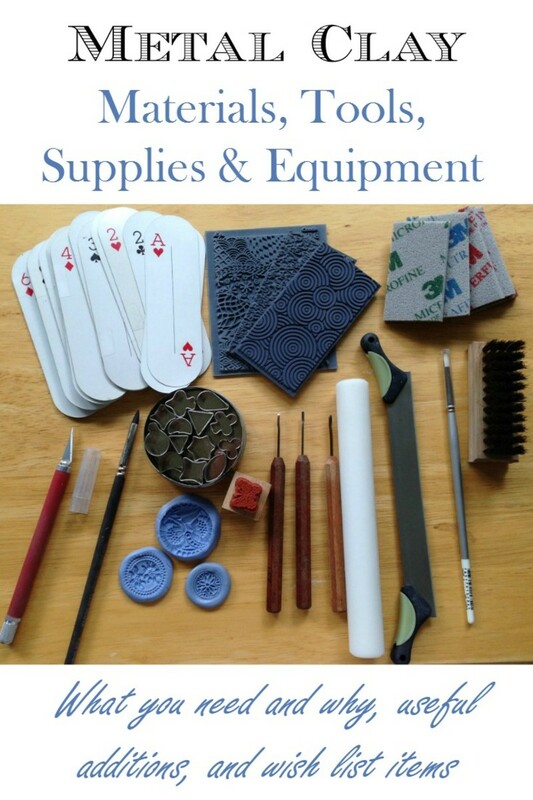 A really helpful and comprehensive list of metal clay tools and supplies. Thanks! I thought that metal clay findings owned by Anthony Squillacci was a Rhode Island based company but when I looked it up on google I could only find a company from overseas. On another note I took a short workshop and the RioRewards with Fred Woell He is Great!! incredibly helpful! I have put you in my favorites and expect to visit again and again as I learn how to use PMC :) YOU ARE SO GENEROUS! This is a thorough Metal Clay lens! Interesting!